Mane N' Tail Detangler By Straight Arrow Products Inc.
Straight Arrow is offering our original formula, Mane ‘n Tail Detangler Spray and Mane ‘n Tail Concentrated Detangler & Shine for your horse! · Available sizes: gallon, 32 oz., 16 oz., 4 oz. · Detangles for easy removal of burrs and other debris while repelling dust. · Moisturizes and helps strengthen, repair and protect against breakage. · Available size: 12 oz. Detangler contains no silicone, but has a unique formula for friction free slip for reduced grooming damage. Does Detangler Condition And Fortify Hair Strands? Yes, Detangler’s conditioning and fortifying formula helps achieve and maintain longer, healthier manes and tails. Will Detangler Work On Wet Or Dry Manes And Tails? Detangler works effectively on wet or dry manes and tails. Detangler is a gentle pH balanced, non-fragranced, non-sticky formula. What Sizes Are Available For Detangler? Detangler is available in a convenient 16 oz. and 32 oz. spray bottle and for economical refills and gallons are also available. What Do Customer’s Say About Mane N’ Tail Detangler Products? My filly’s tail was a total knot. I have tried a lot of detangling tricks in the last 30 years. This was the first time that I used the Mane ‘n Tail Equine Detangler. I sprayed the knot and had it combed out in no time. I have neck, shoulder and arm problems so it’s important to me to have a product that does the job and is easy to use. This stuff is GREAT! First of all, I LOVE your products! I use ALL of them and always get a lot of compliments on how good my horses look. For their hoofs, I have used Hoofmaker and nothing else since it came out on the market. I have Clydesdales and they are known for their bad feet. By using Hoofmaker on a regular basis, my horses’ feet are always in very, very good shape. I also use Mane ‘n Tail Detangler spray. One of my Clydes does not have a docked tail. The Mane ‘n Tail Detangler works really well and a little goes a very long way. When I use your detangler on their feathers, you should see how beautiful it makes them look, especially noticeable when they move. You’ll find nothing but Straight Arrow products on my tack room shelf. 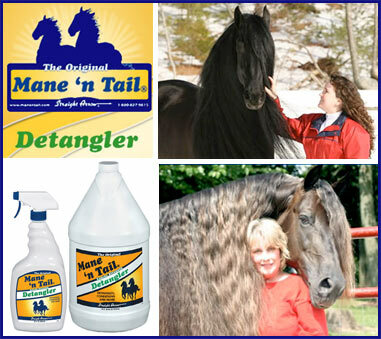 Order Your Mane N’ Tail Detangler Products Today! Don’t battle with your horse’s tangles any longer! All Straight Arrow products are available JeffersEquine, ValleyVet, DoverSaddlery, SmartPak and at most feed and tack stores, but we are happy to get you to our dealers or to help you personally with questions via email or phone calls.